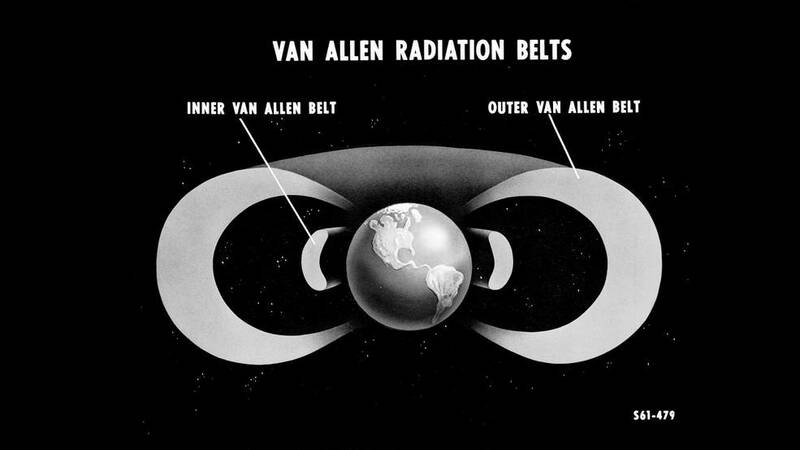 This early schematic of the Van Allen Belts’ structure was created after the first American satellite discovered their existence in 1958. Tick, tick, tick. The device — a Geiger counter strapped to a miniature tape recorder — was registering radiation levels a thousand times greater than anyone expected. As the instrument moved higher, more than 900 miles above the surface, the counts ceased. Scientists were baffled. It was early 1958, the United States had just launched its first spacecraft, and a new discipline of physics was about to be born. Sixty years ago today, the United States launched its first satellite into space. Dubbed Explorer 1, the spacecraft followed just months after the Soviet Union’s Sputnik 1 and 2 spacecraft commenced the Space Age. Data captured by the Geiger counter aboard Explorer 1 heralded the emergence of space physics and ushered in a new era of technology and communications. Far above Earth’s atmosphere, the radiation picked up by the instrument aboard Explorer 1 wasn’t of Earthly origin. In fact, it was from a region scientists previously considered largely void of particles. Prior to launch, scientists expected to measure cosmic rays — high-energy particles primarily originating beyond the solar system — which they had previously studied with ground- and balloon-based instruments. But what they found far outpaced the levels of radiation that would be expected from cosmic rays alone.